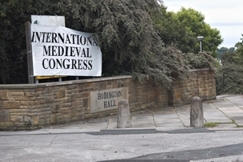 I have to say that I wonder exactly what the point of writing up blog on the International Medieval Congress at Leeds of 2012, on the very day that early registration closes for the 2013 one. I will have to find some way to strike a medium between giving a bald itinerary of papers seen I can barely remember or else reconstructing the whole thing at length from my notes. But the only way to find out what transpires is to try, so here goes. As is by now traditional, I got through breakfast slightly too late to make it to the main room in which the keynote lectures were held and had the weird experience of arriving on the already-full video relay room to see no-one there I knew, which takes some doing at Leeds usually. Luckily this was a misleading omen. The actual lectures, meanwhile, were more or less perceptible if slightly blue-tinged on the video, and were as follows. As an early medievalist, I had not realised that no European king was killed by his successor or replacements between 1282 and 1792. That does seem to want some explanation, and Professor Bagge made dynastic legitimacy a part of it, a factor of stability, but other explanations were harder to come by, and there was some difficulty with the sovereign paradox, the problem that the king makes the law and is thereby able to choose if it applies to him.1 Certainly, there is something special about kingship, but why it should only have acquired full force then was not really resolved. This lecture opened up for us a twelfth-century debate about the worth of monastic rules; in an era when individual concern for one’s own salvation could be put before other’s views of what your soul required for its health, some put the view that the Gospels were the only ‘rule’ that counted. This was not how monastic life had traditionally been envisaged, of course, indeed it rather questioned the necessity or utility of that life for oneself, and such theorists thus started seeing other vocations as monk-like, and society itself as the monastery, which then meant that things like marriage could be seen as requiring Rules too! None of this was ever what you’d call widespread, as we were told it, but it’s interesting to see such thinking in the high era of papal monarchy, which could be imagined as more or less stamping down such autonomous theologising. Then after that, and after coffee, it was charter time. Few people have seen as many early medieval charters as Professor Mersiowsky, in fact I might go so far as to guess that no-one has, and that means he’s seen a lot of charter issuers signing off by way of confirmation. He took us through the earliest Carolingian monarchs’ chosen ways of doing this, largely with crosses or monograms that he thought were in fact done in the monarchs’ own hands until the time of Charles the Bald (840-877) but whose accompanying phrases suggest older referents, perhaps Byzantine or late Roman. The transition from that is the great gap in the evidence that swallows all conjectures, of course, but it was interesting to see rules being set by these kings of correctio in still another way. Sébastien looked for rules slightly further up his documents, in the penalty clauses already mentioned of the charters of St-Pierre de Cluny in Burgundy, now of course searchable, and found that certain words almost only appear in those clauses, such as, “componat“, ‘let him compensate with’, and indeed more surprisingly “Si quis…”, ‘If anyone…’, though this was something I would also shortly find in my own work, I have to say.2 It was not uniform practice in these clauses: innovation and especially elaboration was possible, even if exact grammar and sense were not, always. Nonetheless, something had to do this job recognisably in these documents, and we may here be crossing the difference between what computers can recognise and what the people of the time could. The trouble with later medieval charters is that the vernaculars get in and changes everything, so Dr Otto was sensible and went for numbers instead, looking the size of penalties in the penalty clauses of Emperor Charles IV. These, again, varied within fairly regular patterns; though their effect was more deterrent than real, even for a king like Charles, that deterrent was still worth ramping up on special occasions it seems! In questions there was much asked about how many stages these documents were written in and whether penalties were ever carried out, but my notes don’t suggest any patterns emerged from that, not least because we probably only spoke up if we thought we had a difference to add. But then it was lunch and a canter across to Weetwood Hall for some archaeology. Set phrases in documents, dead bodies, let no-one say I don’t know where the fun is in medieval studies… This session was introduced by Roland Steinacher, who wanted to remind us all that the Roman Emperor Theodosius I actually passed law allowing the recovery of treasure from graves for the benefit of the state, and then we moved on to the papers. This was a question about an assumption, one that could be more general than just with brooches, that the goods in a grave belonged to the deceased. With brooches in the early Middle Ages it’s even a specific assumption that a woman would own a set of brooches that were almost her identity kit, and keep them all her life, which if it were true would mean that they had an age similar to that of the skeletons with which they are found. Enter the evidence, gathered from 27 cemeteries in Baden-Württemberg and Bavaria, where only about 11·5% of individuals had brooches anyway, but where all age groups could have new brooches but worn brooches were certainly most commonly found with older individuals. This provoked Dr Sorg to wonder whether there might be several stages of a woman’s life where she would acquire such brooches, but I have to say that to me the figures she was presenting seemed to show more or less the same levels of wear in all age groups, so that these intervals would be suspiciously evenly spaced at about 20 years. I asked if we might be looking at object lifespans rather than people’s, I must have been reading something… There’s more work needed to identify what’s active here, I think. This paper was about grave-robbing, except that as the speaker said, that’s how we might see it but it’s not clear that the early medieval populations of Francia or Kent did, because it was pretty widespread. She asserted that half of the 600 graves she’d checked had at some point before excavation been reopened, early on as she figured, although this turned out to be on the basis of the very few with several eras of goods in, what is not what you’d call a perfect measure. That half was, however, substantially the ones containing goods, not those without, suggesting firstly that robbery was not the motive and secondly that those opening them could tell which was which still, implying some kind of marker above the surface. The reburiers must have firstly wanted to change the graves somehow and secondly presumably have known that the same would likely happen to theirs. This provoked a lot of discussion and you can see why, a very interesting set of questions despite the methodological difficulties. This paper looked at the development of the idea that Mary will basically be calming Jesus down at the Last Judgement and urging forgiveness of those who appealed to her in life. This placed the real action 1200-1500, but did make the point, probably widely realised, that because Mary was supposedly assumed into Heaven, there are no relics of her body, meaning that her cult is easier to diffuse widely, which I suppose is true. If you were a churchman of seventh-century France, as we’ve observed here indeed, you were probably deeply involved in government; escape from worldly cares was basically impossible, and this means that those who would write lives of saints in that era had to be imaginative about their interactions with laymen of less exalted characters. The patrician Hector of Marseilles was such a layman, a rebel against the king with whom St Leudegar got mixed up, and this paper argued that Leudegar’s biographer tried to get round this by giving him a martyr’s death that should have purged any sin, with imagery of being tested in the fire like gold, and so on, an idea that might possibly have been applied to others of the Merovingian-era nobility who lived messy lives with horrible ends. 1. Addressed repeatedly by Kathleen Davis, Periodization and Sovereignty: how ideas of feudalism and secularization govern the politics of time, The Middle Ages (Philadelphia 2008), pp. 7, 34, 59, 73, 79-80 & 83, inter alia, all more or less in the same words, but it’s worth reading one of the occurrences. 2. J. Jarrett, “Comparing the earliest documentary culture in Carolingian Catalonia” in J. Jarrett & Allan Scott McKinley (edd. ), Problems and Possibilities of Early Medieval Charters, International Medieval Research 19 (Brepols forthcoming), pp. 000-00. 3. That largely because since then I finally read Arjan Appadurai (ed. ), The Social Life of Things: commodities in cultural perspective (Cambridge 1986), which is really interesting and will generate a future blog post. 5. Much of the early material gathered either in Blair, “Dangerous Dead”, or Nancy Caciola, “Wraiths, Revenants and Ritual in Medieval Culture” in Past and Present no. 152 (Oxford 1996), pp. 3-45. Not the most rigorous piece of research-based blogging I’ve ever done, this, but hopefully a bit of fun. 1. As usual, this is Ramon Ordeig i Mata (ed. ), Catalunya Carolíngia IV: els comtats d’Osona i Manresa, Memòries de la Secció històrico-arqueològica 53 (Barcelona 1999), documents from the which I reference as CC4 plus their number in what follows. 3. This being CC4 1446, where the searcher is guided by the fact that the Riu d’Oló bounded two sides and a ridge ran along the third; the estate had several solaria, dovecotes and mills so must have stretched out a bit between those boundaries. This seems like the only plausible spot, being in that bend of the river. Last April, for heavens’ sake, more than a year ago, I saved a stub of a blog post here with the intent of working it up into a post later. The post was going to be about the genesis of a new project, one of the things that had come out of properly working through Catalunya Carolíngia IV, the source edition I make the most use of for my particular patch.1 And now I’m not much more than a month away from giving the first paper out of the project and I still haven’t posted the appetiser for it. So, perhaps I should get round to that. The stub had the title above and consisted only of these words: “What is going with CC4 1265/1409/1410 and why are half its participants only monks sometimes eh I think I have a new paper under work”. So, let me tell you how these things get started. So, this is not too funny by itself, but then we have two original documents dated from the 13th January 983 where all this seems to happen again.3 The donors are the same in both cases, though since this time we have a full text we can see that the scribe had them voice the common formula that it is “good and licit enough to build the House of God everywhere, hearing the preaching of the Holy Fathers that alms may free the soul from death, and being stained with the marks of sin and compunctious for mercy” by way of explaining just what they thought they were doing,4 and it is also specified in the first document (as they’re edited) that Sant Benet enjoys the special honour of being subject to the Holy See, so this is really a gift to Rome.5 This time the boundaries are slightly better organised, with the torrent only on the northern side, and Oliba’s homesteads (Latin casales, as opposed to Castilian ‘casas’ in the regestum counted on the east instead; it looks as if the regestum was mis-copied). This time we also have the full sanction, specifying that people who break in on this gift will share Judas’s fate in the Inferno and have to pay everything back twice over, more or less usual, and we have signatures. And that’s where it gets odd. The latter of the two documents Ramon Ordeig edits here was written, as in the regestum, by Savaric the monk, and the witnesses were a priest called Baldemar and a couple of chaps called Durabiles and Seguin. It would seem that this is the document from which the regestum was made, and one of the mis-copyings must have been the date, the 29th year of the reign of King Lothar winding up as the 25th, XXIX to XXV, it’s not hard to understand. But in the other version, in which the exact same lands are transferred by the same people on the same day, the scribe is a deacon called Athanagild and Baldemar is gone, to be replaced by one Oliba, presumably him with the houses on the boundary. Furthermore, Athanagild’s signature confesses to a number of erasures and superscript additions. Now, I haven’t yet seen the original of this, which is in the monastic archive of Santa Maria de Montserrat. Being a functioning monastery, they don’t have to let me in, which makes the job of access for unknown foreigners a bit tricky. I hope to solve it soon, but till then I can’t contradict Ordeig’s edition, all I can say is that he records no such alterations in the actual text, and that is something his edition usually tries to notice. So although Athanagild’s document was obviously needed straight away, and couldn’t be rewritten, what we have may still only be a close-to-contemporary copy of it. And then someone felt another one was necessary too, at at least enough of an interval to necessitate a different scribe being called on to do it. Somehow both these copies wound up with Sant Benet, but I bet they weren’t originally destined for that fate, because only one of them was registered in the eighteenth century, and that was Savaric’s. Who owned all these separate documents when they were first made, I wonder?